Ever want to try a board sport like surfing, snow boarding, or windsurfing? Now you can in the comfort of your own living room. That’s right! Just hop on the iJoy Human Touch Balance Board at home and forget about the swimsuit or snow goggles. I was recently given the opportunity to review this cool product. Now YOU can have a chance to win one! Entry details at the end of this article. This board is quite suitable for all fitness levels. My entire family had a lot of fun trying out the board. It provides a unique, and interactive way to get fit at home. The main focus is on core stability and lower body toning. It is certainly a very well built machine. It can be used for mild aerobic training as well. The workout involves your hips, legs, abdominal and lumbar muscles, and obliques. It makes very little noise and requires very little space as well. You can test your skills by varying the speed of the board – it has slow, medium or fast settings. You can also choose a 15-minute program that intermittently varies the board’s speed for an additional challenge. You wear the remote control on a string around your neck to provide you with complete control of your workout. For an additional challenge, try adding hand weights. This allows you to work your upper body at the same time or simply increase the resistance for your lower body. I had fun trying to remain stable while attempting squats and alternating balance lunges. 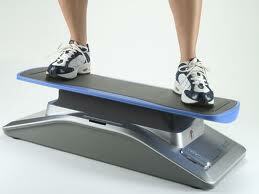 I recommend the iJoy Balance Board as a great piece of stability equipment for the general exerciser. My only critical feedback for the company is that is does not provide guidance on exercises beyond the one standing pose. I ‘m sending them my feedback on this as well. If you enjoy board sports, it’s a great way to keep those muscles in shape in the off-season as well. All-in-all, by training on the iJoy Human Touch Board, you will definitely gain improved core strength and stability that will help you avoid injury and improve your abdominal and lower body strength and tone as well. Now, for the fun part – You can win the iJoy Human Touch Balance Board. This product retails for over $400 so this is quite a valuable prize. Here are the entry details. Please do one or more of the following and leave a comment that you have done so. Please visit PersonalFitCoach.com for contest rules and how to enter. Until next time, have a safe, happy and healthy week ahead. Related Potatoes, Glycemic Index, and "White Foods" - Friend or Foe for a Lean-Body? I'm following her blog too.